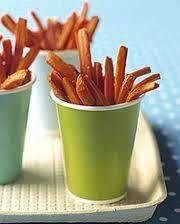 Fit, Not Fat: Carrot Fries! Preheat oven to 350 degrees. Wash and peel carrots. Chop off the ends and slice into “fries”. Put in a bowl and stir in olive oil and sprinkle with salt. Stir until well coated. Spread onto a baking sheet and stick in the oven. Bake for 30-45 minutes, until a little browned and crispy. Enjoy!